overyourhead: Arsenal 3-2 Southampton ..
After a convincing win against Stoke at home last week (3-0) and an impressive win against CSKA Moscow (4-1) last Thursday what could possibly go wrong as the mighty Arsenal took on lowly Southampton yesterday afternoon? Well, lots as it turned out. 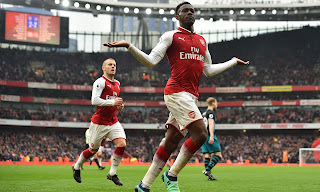 It was a game of great saves and awful defending, of fine attacking play and gripping twists in the narrative, and there was a redemptive ending for the enduring frustration that is Danny Welbeck. He scored twice but missed a sitter. The drama was relentless and for neutrals there was the bonus of seeing the contest descend into chaos after Jack Wilshere’s clash with Jack Stephens in added time. Stephens was sent off Wilshere wasn't. But then Elneny got involved and sent off too. Oh the drama. Great fun.